Get your hands on the all new lineup of LEGO minifigures with Series 7. And each minifigure has its personal exclusive accessories, displayplate and collectors leaflet. 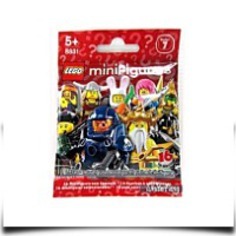 Each and every single in the 16 all new minifigures come in a sealed mystery bag, so you never know which minifigure you might get. A maximum of 16 minifigures may be ordered per address, per household. Which one will you get when you open the mystery bag Series 7 includes Aztec Warrior, Evil Knight, Galaxy Patrol, Jungle Boy, Viking Woman, Ocean King, Grandma Visitor, Rocker Girl, Tennis Ace, Computer Programmer, Bride, Swimming Champion, Daredevil, Bunny Suit Guy, Hippie and Bagpiper. Unfortunately, we cannot accommodate requests for specific minifigures and some minifigures may possibly be more hard to find than other individuals. You may receive 2 or far more inside the identical minifigures trade with your friends to collect them all! 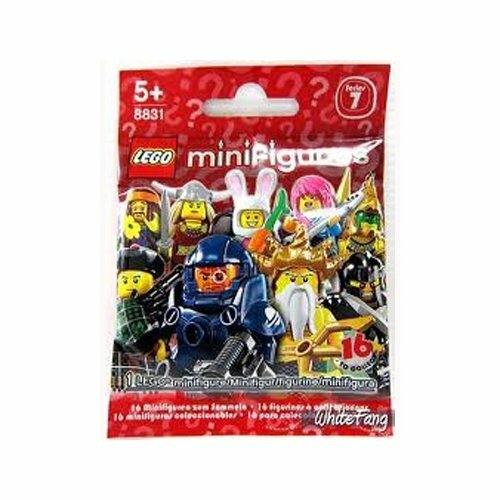 Every minifigure comes with accessories and display plate A musthave for LEGO minifigure collectors PLEASE NOTE Only 1 of 16 individual minifigures in each mystery bag. One of 16 characters, mystery packaging, you don't know which one you will get! Dimensions: Height: 4.5" Length: 3.5" Depth: 1"
Package Dim. : Height: 0.5" Length: 4.33" Depth: 3.54"